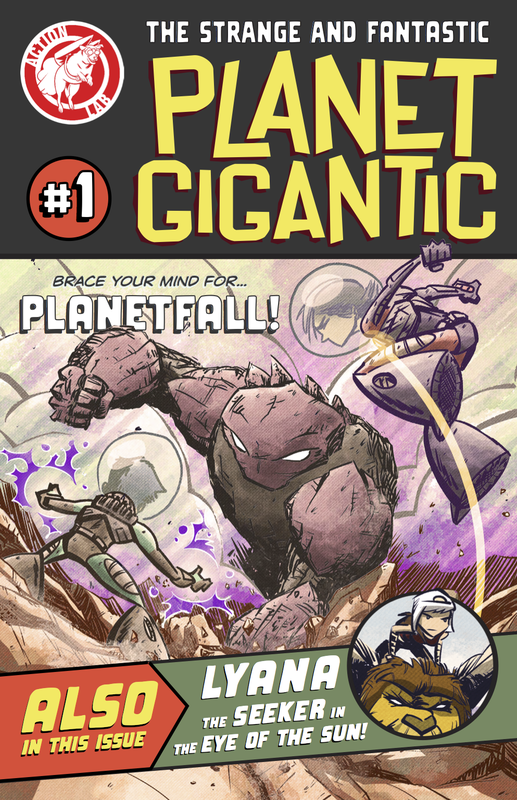 The Fellowship was fortunate enough to obtain a copy of PLANET GIGANTIC #1 from Action Lab Entertainment. Eric Grissom writes and David Halvorson draws. A young brother and sister crash land on a new world. This new planet is lush, green and quite beautiful in many ways, but it also holds many dangers. The kids are resourceful and clever, but trouble finds them soon enough. Then we meet Lyana, who acquires things for people. Her latest job is to find the Eye of the Sun, but getting it will take a great deal of cleverness. There is often a fine line between fantasy and science fiction (sometimes it gets ignored altogether), and this book plays with that line quite a bit. And there’s nothing wrong with that at all. These two stories (their beginnings, anyway) are well written, with enough world building to give us frame of reference and likeable characters to draw us in. The landscapes are beautifully done as well, and the monsters are imaginative (and big!). This new fantasy world has a lot to offer – cool people and creatures, great stories and endless potential. This is definitely one to pick up. PLANET GIGANTIC #1 is available now at your FLCS or at actionlabcomics.com.